Brisbane Festival provided the platform for Dance Energy, a collision of classical and contemporary dance exploring the human struggle for survival and a sense of identity. For the first time Dancenorth, Expression Dance Company and Queensland Ballet joined forces for Dance Energy, creating a thought provoking dance journey for Brisbane audiences. Brisbane Festival Artistic Director Noel Staunton was the main driving force behind Dance Energy. “We have such amazing talent in our own back yard, it is a real treat to bring them together to showcase their incredible skills”, said Staunton. And a treat it was! 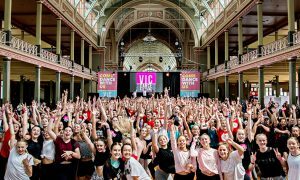 The talented Brisbane based choreographers that produced this inspiring showcase were Dancenorth’s Raewyn Hill, Expressions Dance Company’s Natalie Weir and Queensland Ballet’s Gareth Bellingall. The show then concluded with a work from London based, New Zealand choreographer Cameron McMillan. All of the music used was created by composer, Peter Sculthorpe. The four acts that made up Dance Energy were very diverse but they were bought together beautifully by the combined efforts of Sound Designer Brett Collery, Designer Bruce McKinven and Lighting Designer David Walters. Without their efforts Dance Energy would have not had the same appeal and been the overall master piece that I witnessed. The acts that resonated most with me were Act One, Allegories, and Act Three, The Lament. Allegories was very effective. The sheer simplicity of using white business shirts and suitcases to transform the space was brilliant and had the audience wanting more. A combination of dancers from Dancenorth and Queensland Ballet performed this breath-taking piece, with standout performances from Tere Crilly, Rian Thompson, Robert McMillan,Thomas Gundry Greenfield, Jeremy Poi, Jessie Oshodi and Anita Hunziker. This piece was a brilliant success for Hill as she conveyed a powerful message to the audience. Natalie Weir’s, The Lament told a raw and heart felt story of love and loss through war and conflict. The power carried throughout the piece drew audiences in from the first step. The combination of Expressions Dance Company and Queensland Ballet dancers made for a diverse, yet punchy performance. Riannon McLean, Elise May, Rachael Walsh, David Williams, Jack Ziesing and Piran Scott were stunning. It was also great to see Weir present a dynamic male trio onstage. The raw strength and energy revealed in this piece was outstanding. I hope that this is the first of many shows we see in Brisbane with combined works from Dancenorth, Expressions Dance Company and Queensland Ballet – industry’s driving forces in dance.